A year ago I started to take guitar lessons, every other Monday for forty minutes. That was about all the playing I did, despite having a clear image in my mind of me sitting with friends around a log fire on the beach, playing the guitar and singing. It looks so alluring. As a child I played the piano, and here’s a given: you do not bring the piano down to the beach to sit around a fire, playing and singing. This summer I decided to play twenty minutes a day, for sixty days, and quickly got results. So when I heard Mandy Harvey sing Try on America’s Got Talent, I googled the chords and lyric and printed them out. I figured out a simple strumming pattern and started to practice. On my own – no problem. I sing and play with all I’ve got. But as soon as my daily twenty minutes had to take place with people around (my closest family), either I got extremely self-conscius – having me try to play and sing, as opposed to actually playing and singing – or I simply skipped practice altogether. That same week we had my youngest niece staying for a night, and when the three youngsters in the house were busy watching YouTube, playing games and cuddle with Pop the cat, I pulled out my guitar and did my daily twenty. When I put the guitar away, my niece turned to me and said Oh, that was so nice!, giving me a bit of good “sitting around the fire on the beach”-vibes for the future. We talk a lot about courage, being role models, and daring to do even though you might not be a fully fledged professional, so I figured I’d sing and play the song Try, what do you think about that? Pernilla being Pernilla, was all for it, of course! 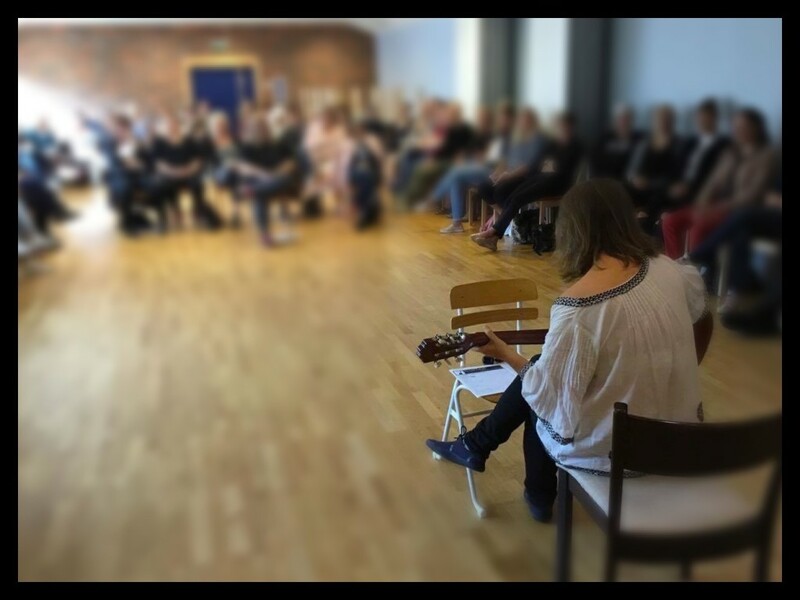 So that Friday I sat, guitar on my lap, and sang, morning and afternoon, for forty and fifty people respectively, after telling them this story. And you know what? I didn’t die, not even once. And the sky didn’t come crashing down. And none of it happened on the following Monday either, when I did a repeat performance for the last group of a total of seventy people! If I messed up noow and again, both with my singing and my playing? You bet, several times. That’s on the house! If I felt less and less nervous each time? You bet, the third time around my voice carried much better than the first two times. If I’ve sung and played the guitar in front of pretty large groups? If I would consider doing it again?